Excellent information ramjet, thanks for taking the time to promulgate. She won't be airborne for a while, first show of the year is planned to be RIAT. That's very informative and interesting and thanks very much for posting it. Never seen it displayed like that before; great. 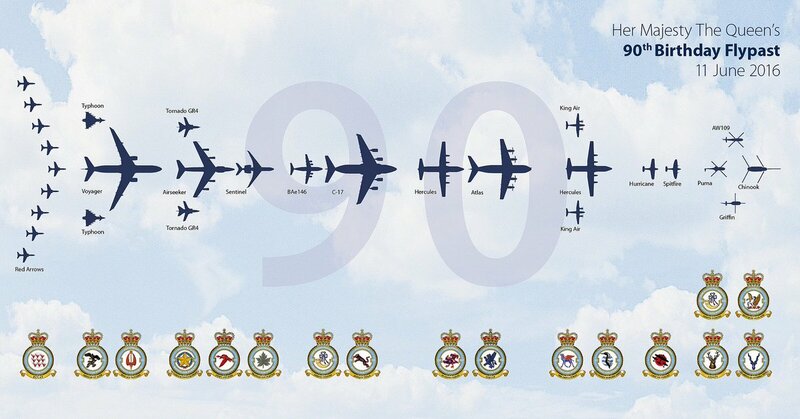 It does show how important transport is in the modern RAF though. You'd have thought for the 90th birthday we'd have been able together a few more! Would have been good to see a a few echelons of GR4s and Typhoons. And why isn't the Tutor wing represented!? You never know,if She reaches a 100,we may get an F35 in the line up as well....may have one in service by then!!!! Reach1985 wrote: You'd have thought for the 90th birthday we'd have been able together a few more! Would have been good to see a a few echelons of GR4s and Typhoons. And why isn't the Tutor wing represented!? Tutors are only leased. Perhaps there are so few just to show her how feeble her Air Force is. All aircraft other than helos, BBMF and Reds seen. Strange routing by the transport element however,as the formations of Herk/King Airs,A400 and 146/C17 routed down the approach on 27R at Heathrow before turning back towards Northolt....usually everything follows the A40 until ott Northolt.....also both Tornados and Typhoons seemed to split from thier respective formations just after passing Northolt,rather than continuing on....weather did look bad out to the west,so poss reason for this? Reds didn't come as there is no Northolt families day today. Whoops nearly forgot, no helos or BoBMF either ! Afternoon All, Just checking some information also, Can advise all of the following for the flypast so far. Again apologies for any duplications but very near Heathrow !. Also apologies for posting in 2 sections. These were quite a way North of the below after splitting up. 2 x Typhoons - Uncoded ! Turned Left Then Right & Then Flew Over Eastern end of Heathrow - Quite an amazing sight ! The Hercules, Two King Airs, Atlas, Hercules, C–17 and Bae 146 came along H3 over us at Teddington Lock. belonging to our various corporate dictators! 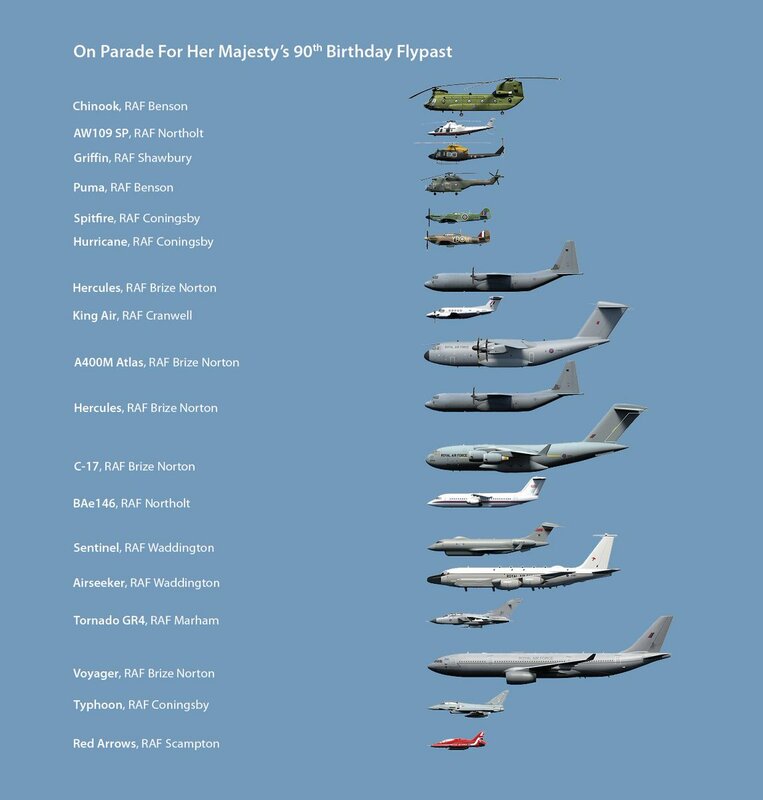 dazgeo wrote: Afternoon All, Just checking some information also, Can advise all of the following for the flypast so far. Again apologies for any duplications but very near Heathrow !. Also apologies for posting in 2 sections. Last edited by Arthur Tee on Sat Jun 11, 2016 6:14 pm, edited 1 time in total. XT949 was allocated to a Northrop Shelduck D.1. It was unbuilt, and the allocated not taken up. Perhaps the poster means ZJ949? What on earth have you been logging that starts XT? !